Although very different in their political cultures, economies, and contemporary development, Algeria and Tunisia face similar crises in terms of leadership, reform momentum, and economic malaise. Algeria will have a presidential election in April, and with the announcement that President Bouteflika will seek a fifth term, it seems the outcome is already certain. In Tunisia, which will host both presidential and parliamentary elections by the end of the year, feuding among the secularists has made the Ennahda Islamic party the likely leader at the polls. Yet Algeria’s façade of a political consensus masks deficits in its economy that may no longer be papered over by remittances from its hydrocarbon exports. As the International Crisis Group (ICG) recently reported, “Despite repeated reform promises, the political system remains paralyzed, led by an aging and ailing president who seems primed to embark on another five-year term following elections in 2019. Whether or not President Bouteflika will actually survive another year is the critical question plaguing both Algeria’s leaders and international organizations and investors concerned with the country’s stability. 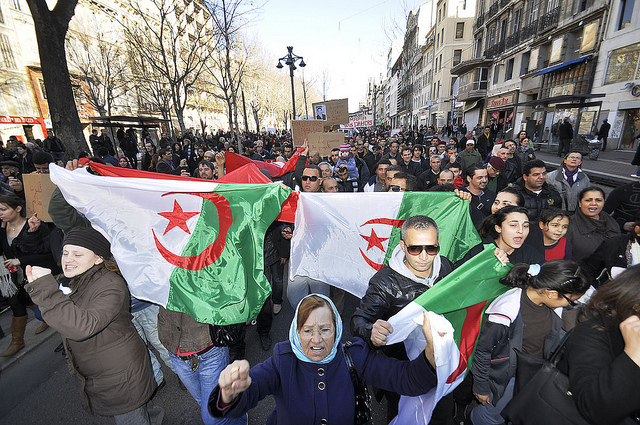 According to a recent MENAS report, the number of rival groups vying to prominence include no less than four or five factions (“clans” in Algerian political parlance) butting heads. These include the Tlemcen clan headed by the President’ brother Said, along with a few notables left over from the revolution who have become enriched under the regime. A fifth clan may be emerging around a number of former generals, especially those who were displaced by Gaïd Salah in the autumn. These clans bring together military leaders and those who benefit from them, making each formidable yet vulnerable to any alliances among the others. This is why Algerians are holding their collective breath wishing Bouteflika good health so that the country avoids dissension that could trigger instability. His last meeting with a senior foreign dignitary was in September, and despite a sporadic upswing in energy revenues over the past year, the country remains lackluster economically. Oil and gas revenues account for 60% of the budget and 94% of export revenues, and with high unemployment among young people, there are rising concerns about demonstrations that could undermine a relatively peaceful presidential campaign. Noting a rise in anti-government protests, the article noted the return of an old formula: bring in the security services to deal with demonstrators. Even a key achievement, the work of the reconciliation commission, the IVD, which took testimony from 50,000 victims of the Ben Ali regime, has been stymied by politicians. But with parliamentary elections due to be held in November, chances of implementation between then and now remain slim. Nine cabinets have been installed since the revoluton, and all have failed to effectively deal with the country’s economic problems including high inflation, unemployment, and corruption. Last week, Essebsi’s party, Nidaa Tounes, now led by his son Hafedh, was dealt another blow when prime minister Youssef Chahed split to form his own organization, Tahya Tounes, Long Live Tunisia. How it will perform in the November elections will largely depend on its ability to overcome the negative perceptions of the prime minister, who has not been able to energize the country’s economy, and any potential alliances it may form. Labor strikes in January and announced again for February pose a significant challenge to the government and will have an impact on perceptions leading up to the elections. Prime Minister Chahed is in a quandary. He has a budget in deficit, cannot afford to raise public wages to the level demanded by the powerful Tunisian General Union of Labor (UGTT), and simultaneously fend off conditions raised by the IMF and others regarding economic reforms. So while a great deal has changed in Tunisia since the revolution, it is now at a point where the “greatest threat to stability is no longer political rivalries around religious identity but unmet social and economic aspirations,” a challenge Tunisia shares with many other Arab and African countries.